Construction is moving along on the Barnone project and we are now mostly moved out of the quonset hut barn. We are going to be living out of shipping containers and a refrigerated trailer in the corner of our field for the next few months. This should definitely be interesting! We have been experiencing some unseasonably warm weather which is creating challenges with our crops. The cool weather crops (lettuce, kale, arugula, broccoli, cauliflower, cabbage, etc.) think that its the end of the season and start to flower. Meanwhile, we are still waiting for the warm weather seedlings (tomatoes, eggplant, peppers, squash, cucumbers, melons, etc.) to get big enough to transplant into the field. So far everything is hanging in there for the most part. We are crossing our fingers that we wont have a gap in production. Spring/Summer CSA Week 2: romanesco cauliflower, romaine lettuce, i'itoi onions, rainbow chard, Italian flat leaf parsley, white sonora wheat berries, lisbon lemons. 1. Heat olive oil in a large soup pot over medium heat. 2. Add in the onion, celery, and carrots and cook until tender, 5-6 minutes. 3. Add the garlic and cook 1 minute. 4. Add the broth and cover the pot. Bring the liquid to a bowl now over high heat. 5. Stir in the wheat berries and simmer until they have cooked and are tender, about 35-40 minutes. 6. Transfer about 3 cups of the soup to a blender and puree until smooth. Return the blended soup to the soup pot and stir well. Add in the beans, tomatoes, and collard greens. Add in the salt, pepper, and rosemary. Cook all until the collard greens are tender, about 10-12 minutes. 7. As the soup finishes cooking, turn your oven onto broil. On a baking sheet place sliced pieces of the baguette and drizzle with olive oil. Place under the broiler for about 4-7 minutes, until the edges have browned. Watch carefully as to not burn the bread. 8. Enjoy! 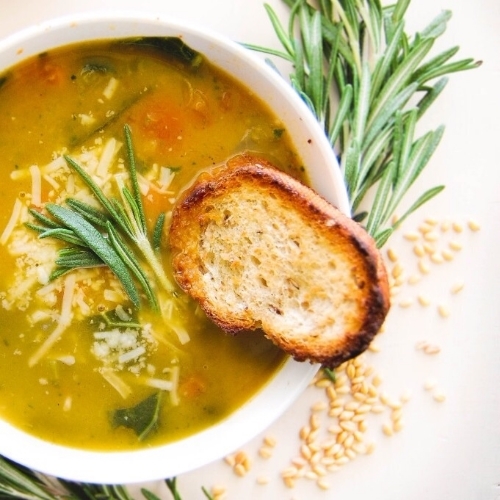 Serve warm in your favorite bowl, topped with grated cheese and served with a piece of bread. 9. You can store the remaining soup in an airtight container in the fridge for up to one 1 week or in the freezer for a couple of months.